Get Ready for Ricky! Batten down the hatches, board up the windows, lock every door, she's a'comin'! Sony has finally debuted the first trailer for Ricki and the Flash, the newest film written by Academy Award-winner Diablo Cody, starring Academy Award-winner Meryl Streep, directed by Academy Award-winner Jonathan Demme. But does all that past winning make for a good film? You tell us. 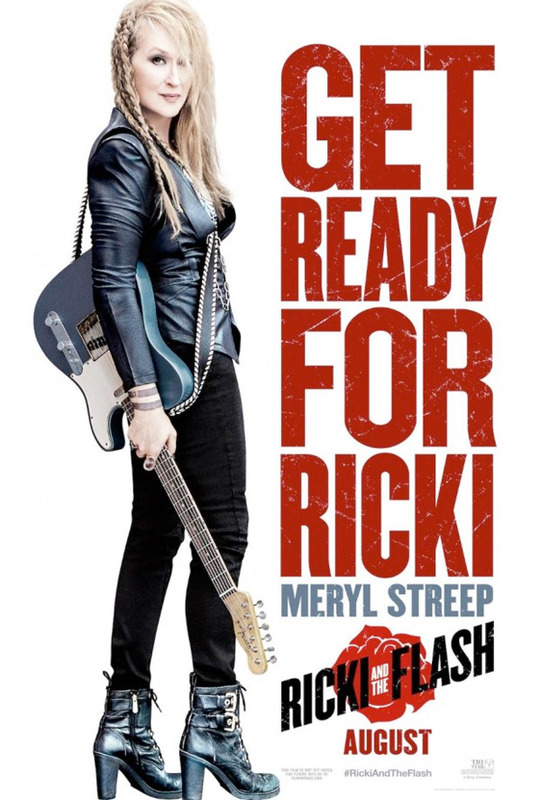 Streep stars as Ricki, a rockin', rogue, guitar playin' mother who must head home to rekindle a rocky relationship with her family. The cast includes Meryl Streep's real life daughter, actress Mamie Gummer as her daughter Julie in the film, along with Kevin Kline, Audra McDonald, Sebastian Stan & Rick Springfield. Fire it up below. In an original and electrifying film loaded with live musical performances, Streep stars as Ricki Rendazzo, a guitar heroine who made a world of mistakes as she followed her dreams of rock-and-roll stardom. Returning home, Ricki gets a shot at redemption and a chance to make things right as she faces the music with her family. Streep stars opposite her real-life daughter Mamie Gummer; Rick Springfield, portraying a Flash member in love with Ricki; Kevin Kline as Ricki’s ex-husband; and Audra McDonald as Kline’s new wife. Ricki and the Flash is directed by Academy Award-winning filmmaker Jonathan Demme, of Silence of the Lambs, Philadelphia, Rachel Getting Married, from a script by Diablo Cody, of Juno, Jennifer's Body and Young Adult. Sony will release Ricki and the Flash in theaters August 7th this summer. Anyone? Well, then...I may just have to see this musical thing. This is how you make a by-the-numbers excellent film. Good to see it works out in the end of that trailer movie. I think I've seen this but with different actors and different characters. It's nice of them to show us how it ends. That'll save time. This looks pretty terrible. Streep will probably deliver an "Oscar-wrothy preformance," though. Is this a different "Jonathan Demme"? Did I just watch the cliff notes version of the movie? Now I know the whole movie. But still, anyone going to see this is only going because of Meryl Streep's acting, so spoilers don't matter. WHO NEEDS IT? Meanwhile- - - "WALT DISNEY is the ONLY real artist --------------------------------Hollywood EVER produced." STANLEY KUBRICK With the KUBRICK---DISNEY expose about to be released, is STREEP going to COME CLEAN on her obedient CHEAP SHOT at the DEAD Disney? SHE --AIN'T gettin' any younger. And her work AIN'T gettin' any more original or memorable. Excellent movie and see this film as a big rock ... priceless !! Bravo Meryl Streep! !